Every student council’s goals should revolve around the students and the candidates for the IGNITE election weren’t short on that. There were many concerns raised during the IGNITE North campus candidate forum on Monday but everyone appeared to agree on one thing – there needs to be better communication with the students to meet their needs. The Forum consisted of the two presidential candidates, the current vice president of Lakeshore Allisa Lim and Monica Khosla; three North campus vice president candidates Jason Hyatt, Jeremy Afonso and Kuljeet Singh; and four North campus board of director candidates, Md Asaduzzaman, Shayan Shakil, Tashornna Simpson and Ehinomen Idialu. Current IGNITE president Maja Jocson led the panel alongside the board of directors’ chair Nicholas Davenport and Guelph-Humber board of director Allyson Sander. Vice president candidate Hyatt may not be elected to office yet, but he is already eager on getting a PRESTO machine on campus. Hyatt said he has already talked to PRESTO and TTC about placing a PRESTO machine at North campus and it is what Humber students need. One of Afonso’s main platforms, if he is elected, is to create a plan that would help and benefit students if there was to be a strike again. “I want to revise guidelines so that students don’t have to suffer the penalty of not being able to finish tests, assignments, quizzes or reports during their time in the strike and making sure they get everything done on time,” he said. 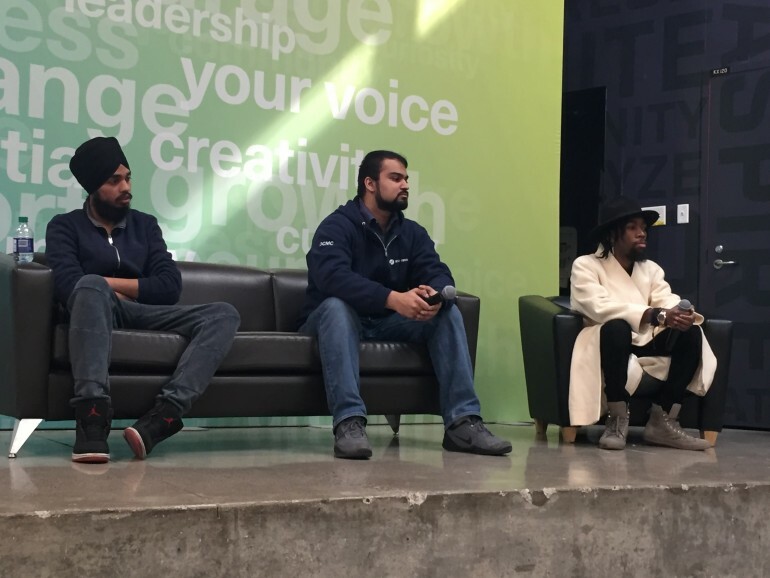 Meanwhile, Singh’s platform focuses more on international students, saying he wants to help with the hurdles they face when coming to Humber, especially the language barriers. The main event of the forum was when IGNITE presidential candidates Lim and Khosla hit the stage. Both shared their thoughts on how they want to communicate better with students. When Lim spoke about communicating with students, she brought up the strike as an example on how students were left frustrated. Lim had her menstrual hygiene kit pilot project come to life this year and she hopes to expand it if she becomes president. She said that in future, she would like to add other products to the kits such as razors and pregnancy tests. Khosla is focusing her platform on accessibility, awareness and advocating for students. The last question asked by the panellists was why do they want to be the president. Kholsa said she wants to see a change in the school, and highlighted those changes brought about with her persistence. “Our student cafe got an accessible washroom because I pitched that idea last year because there are students here who are handicapped and they have to go so far just to go to the washroom and be disconnected from their social circle,” she said. “I implemented that and now it’s actually put there and I’m proud about it,” Kholsa said. Lim, on the other hand, reflected on her time as vice president of Lakeshore and how that was one of the big reasons she was encouraged to run for president. Voting is during the week of March 12 to March 16, when the polls close and the winners will be announced.